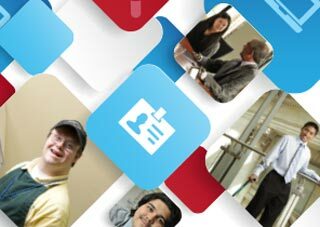 About the Campaign for Disability Employment | What Can YOU Do? These are messages that bear repeating far and wide. And that’s what the Campaign for Disability Employment (CDE) is all about. The CDE’s multi-faceted campaign called “What Can YOU Do?” features a series of public service announcements (PSAs) and coordinating media products, all designed to promote positive employment outcomes for people with disabilities. Our products and positive messages are encouraging businesses and others to recognize the value that individuals with disabilities bring to the workplace, and the benefits that come with full inclusion. The CDE’s four powerful PSAs—“I Can,” “Because,” “Who I Am” and “Working Works”—have aired more than 325,000 times on television and radio stations nationwide, earning more than $64 million in donated airtime. All can be downloaded from the CDE website, along with other tools and tangible ideas for supporting the Campaign’s goals, such as discussion guides, posters, a CDE support badge, and ready-to-publish news briefs for publications and social media platforms. So what are you waiting for? Learn how to join our movement, and get started today!